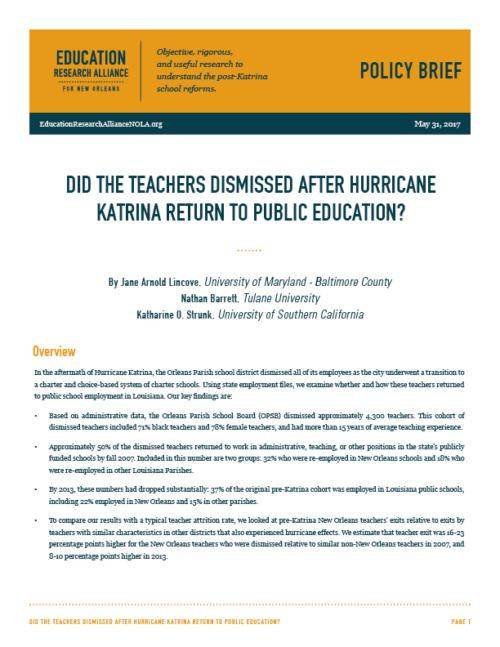 A policy brief and technical report by Jane Arnold Lincove, Nathan Barrett, and Katharine O. Strunk on how and whether the 4,332 New Orleans public school teachers dismissed after Hurricane Katrina returned to public school employment in Louisiana. Based on administrative data, the Orleans Parish School Board (OPSB) dismissed approximately 4,300 teachers. This cohort of dismissed teachers included 71% black teachers and 78% female teachers, and had more than 15 years of average teaching experience. Approximately 50% of the dismissed teachers returned to work in administrative, teaching, or other positions in the state’s publicly funded schools by fall 2007. Included in this number are two groups: 32% who were re-employed in New Orleans schools and 18% who were re-employed in other Louisiana Parishes. By 2013, these numbers had dropped substantially: 37% of the original pre-Katrina cohort was employed in Louisiana public schools, including 22% employed in New Orleans and 15% in other parishes. To compare our results with a typical teacher attrition rate, we looked at pre-Katrina New Orleans teachers’ exits relative to exits by teachers with similar characteristics in other districts that also experienced hurricane effects. We estimate that teacher exit was 16-23 percentage points higher for the New Orleans teachers who were dismissed relative to similar non-New Orleans teachers in 2007, and 8-10 percentage points higher in 2013.